TR: As we move forward into 2015 and the next 4 years with a new Council it is a priority for me to ensure that we keep a balanced approach and the basic organizing principles of sustainability at the heart of our decisions. This will ensure that we are planning with a focus on the future ensuring prosperity in the areas of our town’s ecology, economics, politics and culture. TR: Decreasing GHG and our carbon footprint should be a priority for our local government and residents alike. I feel that there needs to be more education surrounding the importance of this issue for council, town staff and the community at large. Our parks and rec department would place to start when addressing our GHG emissions as well as partnering with organizations such as LUCI. A town wide Challenge to reduce our emissions that educates and engages our local government, residents and businesses could be one approach to reaching out. TR: Development of an ICSP is an important part of the future of Cobourg. In order to have a successful ICSP we must first have an adopted Official Plan that includes approved Zoning and Heritage Master Plan components. The Zoning portion of the plan must approved by the province and we are currently awaiting a decision before moving forward. I think it would be realistic to think that an ICSP could be adopted in the next 4 years. The cost has been estimated at $100,000. 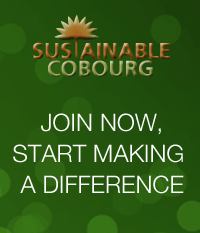 Utilizing the resources of organisations such as Sustainability Cobourg, the Active Transportation Committee, the GRCA as well as the community at large will be an important part of the plan creation. TR: As someone who enjoys using my bike as a mode of transportation, especially with my children, I understand the need for more clearly defined active transportation lanes that connect our community. It is a health and safety issue not to be ignored. A commitment from Council to make active transportation a priority is the first step, a plan to move forward and then action. Open lines of communication with the public and Active Transportation Committee will be key. I like the concept of certifying the bicycle friendly towns and would like to see Cobourg on that list.